Submit news to share with our members and subscribe to the INS Newsletter. Call for Neuroethics Abstracts – The INS invites researchers from around the world to submit abstracts for presentation at our 2019 annual meeting in Chicago, IL, USA. Welcome are abstracts related to the field of neuroethics from any disciplinary background, whether the work is empirical or theoretical in nature. Review the call for abstracts for deadlines and requirements. Neuroethics Essay Contest – Now in its sixth year, the 2019 Neuroethics Essay Contest aims to promote interest in neuroethics among students and postdocs from around the world. Submissions are welcome in one of three categories: Academic Essay, Essay for a General Audience, and High School Essay. With support from the International Youth Neuroscience Association (IYNA), the contest is now open for high school students and submissions in this category will also be eligible for inclusion in the IYNA Journal. Review the call for essays for the deadlines and requirements. 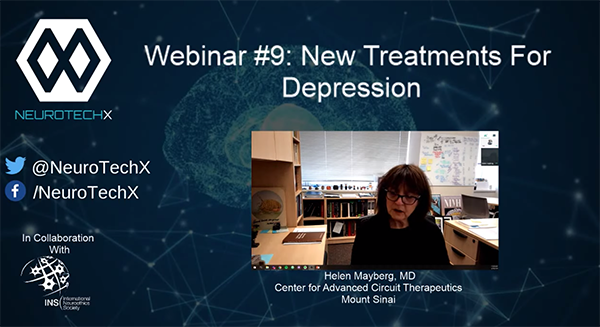 NeuroTechX Webinar on DBS – Watch the full presentation (YouTube) from INS Board member Helen Mayberg discussing how deep brain stimulation (DBS) got started and why, the push for commercialization by industry, and how the needs of the patient and the risks of no treatment options are balanced by the need for care in design and use of new technologies.